(Waldorf, MD) Today, Ford Motor Company awarded Waldorf Ford with the prestigious Triple Crown Award. This is the 9th year that Waldorf Ford has won this award. The Triple Crown Award recognizes dealerships that have won the President’s Award and the One Hundred Club Award, but who also ranked high enough to be included in the Ford Customer Service Premier Club. Ford Motor Company also presented The One Hundred Club Award for 2014, which recognizes dealerships that are in the Top 100 in Ford sales for the nation. Waldorf Ford is one of only 15 dealerships in the country and is the only dealer in the Washington DC region to win the 2014 Triple Crown Award. 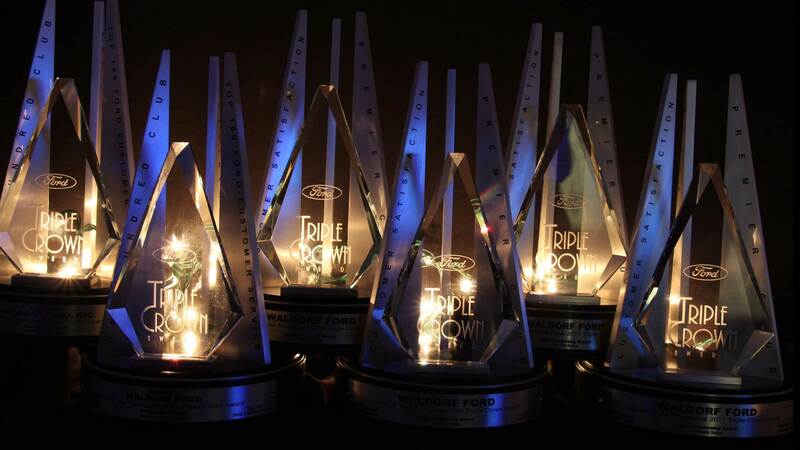 Waldorf Ford is among only 5 select dealerships in the United States to earn the Triple Crown Award for 9 or more consecutive years.